We’ve exposed our concern for your safety, as patient or someone looking for this treatment option. In today’s topic for the “I.P.T. Certified-M.D. 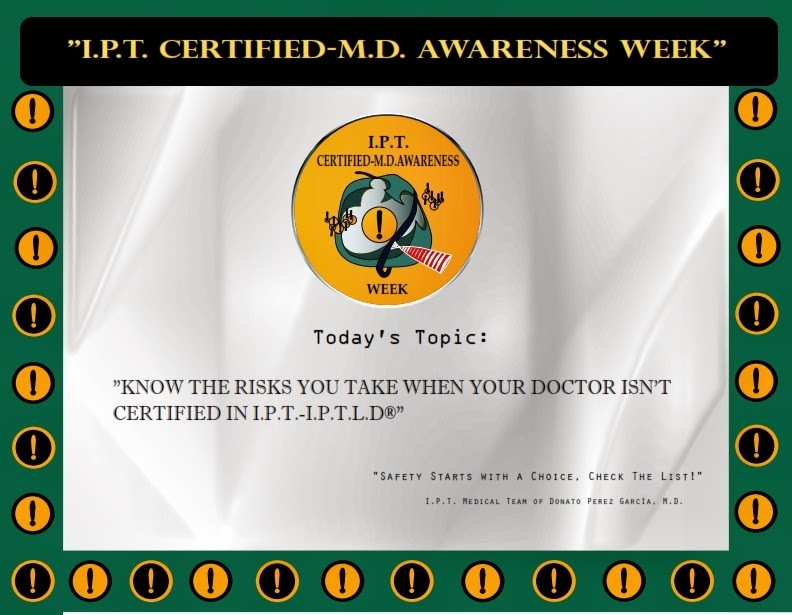 Awareness Week” we want you to know the actual physical risks you take when not choosing an officially certified I.P.T Physician. Since the beginning of Insulin Potentiation Therapy back in 1930, medical procedures and pharmaceutical drugs have change tremendously and no doubt will continue evolving without end. New and better drugs are available today, new discoveries in the knowledge of the human body, research and clinical trials in the combination of pharmaceutical compounds, etc. I.P.T has also been evolving and modifications are being made constantly made to better the treatment, use better medication or change dosage and methodology that can prevent discomfort, thus enhancing its potency. 1. Difference in Substances and Delivery Methods since 1930. 2. Knowing how to combine medications and dosage for each health problem, for best results, with less amount of toxicity. 3. Time frame of delivery of substances (very Important). 4. New Method of calculating the amount of Insulin for each patient. 5. New methods in controlling the effects of hypoglycemia. 6. Revised Parameters in the blood levels of glucose. 7. The amount of sugary substances the patient ingests in the post recuperation part of the procedure, to bring normal levels of glucose in the blood. 8. Reduction in the adrenergic effect, caused by the release of adrenalin as a response to lower sugar levels in the blood induced by insulin as well as the metabolic changes. A doctor who’s not certified or updated on these matters, can cause a serious damage to the patient. That’s why Dr.Donato encourages all I.P.T Physicians to be in constant training and emits an expiration date on all licenses, to make sure they’re updated and prepared for any complication during the protocol. Unfortunately many doctors take the treatment into their own hands. They think they learned I.P.T from someone else, but were never evaluated nor officially certified by Dr. Donato. Others never bother in updating their knowledge and continue administering I.P.T. without any supervision. This puts the patient at risk. Timing is everything when it comes to I.P.T. It is crucial the I.P.T. Physician knows the exact time when to perform and expect the "Therapeutic Moment". If he's not trained of evaluated in this important part of the procedure, there is a high risk of increasing the adrenergic effect induced by insulin, this means that he won't have control over how much adrenaline your body releases, leading to an increased blood pressure that will create resistance when administrating the medication, diminishing the effectiveness of the treatment, lower success rates, that means more treatments for the patient without positive results. 1) Patient Care and Procedural Skills. 2) Demonstration of competence in medical knowledge relevant to Insulin Potentiation Therapy. Observing the candidate's ability to explain indications, counter indications, methods for preparing the patient, chemotherapy and non-chemotherapy drug indications and side effects, pain management, proper techniques for handling and obtaining specimens and fluids. 3) Practice and Improvement learning Skills. 4) Good Interpersonal and communication learning skills with patients; ability to clearly explain to a patient, the facets of the procedure, necessary to obtain information for consent. It’s not an easy thing. Many doctors and associations don’t want to do the hard work and skip this important part, which is Official Certification. Please be aware of this situation, be sure and check the official list of Certified IPT/IPTLD Doctors, trained and endorsed by Dr. Donato Pérez García. Our concern, as the IPT Medical Team and Donato Perez Garcia, MD. is always your safety and well-being. This treatment option is for you the patient; to benefit from years of anecdotal research and development so you can heal, continue having a good quality of life to do the things you love in life. It is my responsibility to make sure you are in good hands when undergoing my treatment, which is why this “I.P.T. Certified-M.D. Awareness Week” is so important. If you’ve made the choice of IPT, choose your doctor wisely and carefully. Where can I find the list of Certified and Endorsed I.P.T. Physicians? “Find the right IPT Therapist: List of Endorsed Physicians by Donato Pérez García”. Social Networks: Facebook, YouTube, Twitter, Google+Pages, Pinterest, Foursquare and LinkedIN. * YOUR SAFETY IS EVERYTHING. BE AWARE! * OFFICIAL LETTER FOR THE "I.P.T. CERTIFIED-M.D. AWARENESS WEEK" FROM DR.DONATO PEREZ GARCIA. SAFETY IS EVERYTHING, BE AWARE!